I’ve put the nailhead curtains up in the living room. The color is perfect with the couch, but it may be a little too perfect (bordering on matchy-matchy). And I actually miss the zip of the yellow curtains! It looks like Brandon may have been right after all. What do you think? The curtains look great, but I think anything you decorate with is awesome. Add yellow back into the room with a yellow lamp or inexpensive throw pillows, or better yet $4 yellow carnations from the grocery store. Ever think about some artwork in that corner? I don’t comment on here as often as I should, but thanks for continuing to be inspiring! PS. Your daughter is such a cutie! Not too matchy-matchy! I say keep them all Winter and bring the yellow back in Sping. They make the room look so calm and pretty. Thats exactly what I was going to say! I think they’ll be nice with the holidays coming up also. It’ll be a more subdued back drop for holiday decor. Yep, I’ve been thinking about doing that. If I’m going to have a pink tree, it may be nice to have a little less color behind it! I’d have to agree with your man on this one. While I too adore the nailhead curtains, they dull down your room because they are dead-on with the couch. Hand up the yellow ones and it adds vibrancy back, creating a cheerful space during the upcoming chilling Chicago winter. Love the nailhead curtains! Love the yellow ones, too. It’s just one of those things – if you never knew the other existed, it would seem perfect. Exactly. Either option would have been fine had I not seen the other! Now I can’t decide. I prefer the nailhead ones. They are different and you could always throw some yellow in with art, flowers, or pillows. I say keep the nailhead curtains up for a while and see how you feel after the holidays. If you are still torn, put the yellow ones back up and see how you feel about them. I love those curtains! The yellow ones were nice too, but these could work if you put some yellow (or another colour) around the room in decor pieces. Your living room looks so serene and peaceful. The curtains are a wonderful addition. swoon! I too have been watching those curtains for a while now. I say keep them. Why not bring the yellow ones out for spring and summer and go with the nailheads for winter and fall! I have to agree with Brandon. The yellow really works better. Those nailhead curtains are gorgeous though. Maybe somewhere else in the room? I’ll have to agree with Brandon. I like the yellow better. The room felt more alive with those. i absolutely love them – i think they pull the space together and the nailheads are a great ‘hard’ balance to your pink! KEEP THEM!!! the yellow with the pink was too much warm color for me… this is perfect. Add a pop of pillow and art, and voila! done. yellow although i really quite love those curtains! I think Brandon was right on this one…the yellow adds more color and isn’t so matchy-matchy. But since you can return these curtains, you can spend the money on another fun item in the room. i like these curtains. what about changing up the tassel curtain wrap to something that is more substantial and intersting?? That would probably help. I felt like the tassels were too wimpy next to the nailheads. I love the zip of the yellow curtains – but I love the masculine contrast of the nailhead curtains. Maybe you should just nailhead the yellow curtains yourself? those curtains are pretty, but I do have to agree with Brandon on this one. The yellow ones looked great! While I like the look of both curtains, I definitely prefer the punch of color from the yellow curtains. I think there was something a bit more breezy and playful about the yellow curtains that really worked in the space. The nailhead curtains, while absolutely amazing, just seem a bit too heavy and stern for the whimsy of the room. I like both of them so it’s hard to say… maybe change them every six months or so to correspond with the seasons? I miss the yellow….but perhaps a seasonal change would be nice as suggested? But lovely as usual!! The yellow curtains add a lot more POP. My vote is for the yellow ones. Pretty and cozy, but I think I prefer the yellow. Maybe go with the nail head for fall/winter and swap them out for the yellow ones in the spring and summer? I’ve never posted, but love reading your blog! The nailhead curtains by themselves are gorgeous. However, I LOVE the yellow ones. In fact, those yellow curtains behind your daughter’s monthly pic, made me want to go out and buy similiar ones. GO FOR THE YELLOW!!! I think Brandon’s right. The yellow curtains really do bring the room together! I think they look very nice. Your living room looks calm, serene, and very tasteful. The thing is, though, that it’s not really you. Not that you aren’t serene and tasteful, it’s just that your decorating is more interesting. I mean, how many people do we know who paint the main of their house pink? Not many. The nail head curtains are very pretty, but in the room they don’t do much to make it interesting. Exactly. I think they’re gorgeous, and I’d recommend them to anyone, but I just don’t know if they’re right for ME. Looks awesome! I can’t wait to see them with your pink tree. I vote for the yellow ones. Did you buy the 96″ long ones? I like how they pool a bit on the floor. They’re 108″ long. The living room has higher ceilings than the rest of the rooms in my home. The curtains are nice but I have to go with Brandon on this one. You recently talked about how little light your living room get in the winter. I say add the sunshine back in with those gorgeous yellow curtains. I hate to say it, but I agree with Brandon about the yellow curtains. I like these, but in a Kelly Hoppen-type house, and yours is more lively. love the nailhead curtains…but I think brandon was right. The yellow had a bit more contrast – these actually make me a little sad in that room – though I would love them elsewhere! maybe brandon’s office? Love them! I have linen curtains but they just blah’d out my living room more because I have linen-colored walls (rookie mistake, I know). they do look a little flat, but i would save the yellow curtains for the spring/summer. what about a pattern– even tone-on-tone? something a little splashier than a solid but not too loud. Well first of, anything you do is simply amazing. I like the nailhead but I tend to agree with those who liked the yellow ones better. I’m all about the punch of color and I think they looked fabulous in there. I think they look great next to the pink walls. Matchy matchy didn’t even come to my mind! I would leave them up for now. linen for fall/winter, and yellow for spring/summer. Sorry to say but I really love the yellow ones. Was looking at them with Eleanor’s photo and love the ‘pop’ they give in the room. I have to confess that I prefer the yellow ones. They make the room brighter and happier. :) It is such a pretty room! the yellow ones gave the room that beautiful vintage feel. they were timeless, effortless and calming…almost unnoticed. Definitely the yellow ones look better there. The linen are also pretty but maybe in another room. My vote is for the yellow curtains. More punch. Love the nailhead curtains… They are a little matchy matchy, but I think as long as you don’t coordinate any of your other accents to them (and the couch) you’ll be golden! I agree with the yellow curtains. They added such a brightness to the room! I loved the punch of colour with the yellow, however love the nail detail with these. You could add some interest to these by sewing a panel of contrasting fabric along the bottom 1/4 or 1/3rd? Yep. Gotta say I like the yellow better. Love contrast, and that’s what the yellow brings to the room. I usually don’t like yellow, but I think the former curtains were a better choice for the living room. I do LOVE those nailhead linen curtains though! Maybe then can go in another room? Or you could add yellow somewhere else in the living room to bring back that zip? Ok, I’m a bit biased because I adored your yellow curtains. Loved and coveted them. These curtains are ok. The details are nice, and the color does really match, but I though the yellow curtains added an extra shock of femininity, color, and just downright loveliness to the room. ps. I just saw your wreath pictures on flickr! Would you consider posting a how-to on here?? Because I, personally, would be freaking estatic! Thanks! I’ll show the wreath tomorrow morning. Hate to say it but I think Brandon got you on this one. I vote for the linen. Love them. 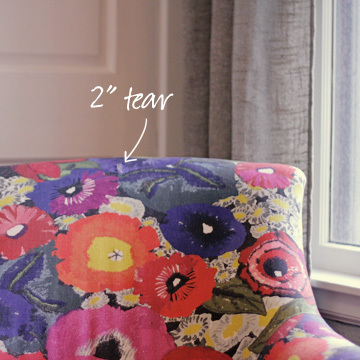 I’m torn between my allegiance to the nailhead curtains (which I bought for myself!) and the bright bursts of color which I think are more characteristic of your style. I’m a fan of the yellow curtains. I say go back to the yellow curtains but add the nail heads to them! The best of both. 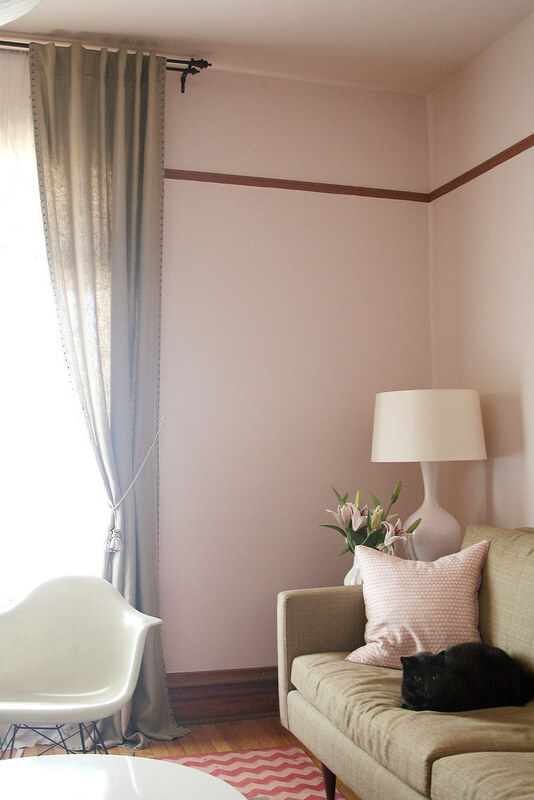 I think we’d all like the nailhead curtains more if there was some punch of color somewhere else in the room. One thing I really like about the yellow curtains is how it goes with the painting which brings out the floral pillow that goes with the rug and makes the whole room more interesting. Makes you notice things you might not otherwise notice. Now everything is too calm. It isn’t that it isn’t beautiful. It is that. It’s just no longer interesting. I hate to say it, but I like the yellow better! Keeping the more neutral ones up for the holidays (with your pink tree) sounds like a good idea though. I think the linen curtains are so beautiful! I think you should just put up a framed piece of art to add a little color. Maybe just go with a yellow frame, with some subdued art. I LOVE this room. It’s peaceful and adult and really beautiful! Personally, I liked the yellow better, but I think both fit in this room. I think the issue is just needing a change based on the post you made when you purchased these cutains. Once I get everything exactly how I want it, a month or so later I want to rearrange this or buy that. I think having both curtains would give you something to change out. I agree with the first comment, to use both at different times of year. The yellow is nice and zippy for spring/summer and the nailheads are a nice peaceful backdrop for the holiday hubbub of the fall/winter (especially with that swanky pink tree). Options are always a good option. Yellow was better. This is too mono. I like the new curtains – they are beautiful and so versatile. You can always change the look a little by changing the ties too. What about putting the pillows that used to be there (in the yellow curtain pic) back on the couch? I like the yellow better too. I definitely like the new curtains better! It ties the room together better than the yellow one’s did. I like it. It creates a calm area. Sometimes I need that. Ah non! non! Keep them. They’re perfect. While I like the new curtains, the yellow curtains gave a more “luxe” feel and wasn’t so matchy. The nailhead curtains are very predictable. Anything looks perfect if there is a cat on furniture in the picture. I’m envious. Anyways I digress, LOL. I love your new curtains. Change the tassel pullback. PS Your daughter is so beautiful! i agree with the holiday strategy – mild color background for holiday color! but the yellow is fun. nice to have options. another note – how do you like your couch? I like both (which I’m sure really helps your decision!). However, I agree with the posters who suggested using the nailhead curtains for the winter and then changing in the spring. What about doing something to the sheers to give them some zip? I don’t know what that would be, but you are so creative, I know you’ll think of something. Yellow is my vote, I am a self confessed yellow-junkie, so I might be a tad biased…but I do love the unexpected whimsy they bring to your room! there is just something missing! I love the nailheads, but would agree with Brandon on this one! Nope! I love those curtains, don’t change a thing. If you’re really missing the yellow, a throw pillow would be perfect. That way you can change it anytime. Love them! Very sophisticated – and I really like that perfect amount of “pooling” on the floor. I see you change your curtains a lot and I don’t even have any! I want to hang them, but I am too scared. I don’t know where to begin… Any advice on measuring, etc.? Melanie, I like curtains hung high, close to the ceiling, and a little wider than the window. OK, I have returned the linen curtains. I liked them, but I didn’t love them, so back to the store they went. Hope- I don’t know if you’ll ever read this, but I’ve seen similar curtain rods at Target for years. I’m sure they’ll have something close. Thanks for responding Jessica! I looked at Target but couldn’t find a double rod like this… so I broke down and bought one at Pottery Barn. More than I wanted to spend, but it looks good. I need 6 of those…anyone know where I can get hold of them???? I am desperate!! !